The�U.S. 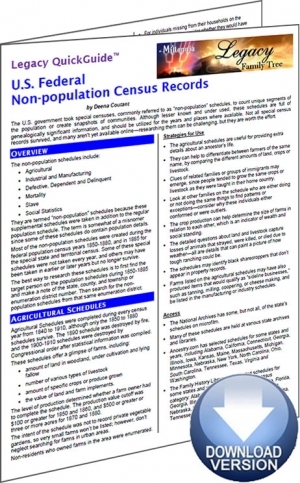 Federal Non-population Census Records�Legacy QuickGuide™ contains useful information including the different types of non-population schedules, access points for these records, and strategies for using each group of records. Also included are links to websites and resources covering agricultural schedules, mortality schedules, manufacturing schedules, “DDD” schedules and more. This handy 8-page PDF guide can be used on your computer or mobile device for anytime access.